Menu Plan Monday ~ Dec 20th Christmas Menu! If you didn’t get a chance to see it, I posted yesterday about the holiday menu planner that I use and included the free printable for you as well. Be sure to check it out! I’ve been a baking machine these past couple of days and I wanted to share the recipe links with you because these are all very simple and quick holiday recipes. Easy, easy! Finally I made some Chocolate Pretzel Bites…delicious! So there you have it, easy and simple recipes for your holiday enjoyment! Have a wonderful Christmas everyone!! Don’t forget to enter to win a copy of my newly released book, Clutter Rehab: 101 Tips & Tricks to Become an Organization Junkie & Love It! 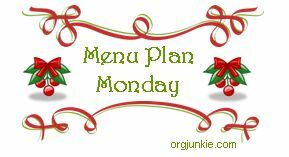 32 Responses to Menu Plan Monday ~ Dec 20th Christmas Menu! 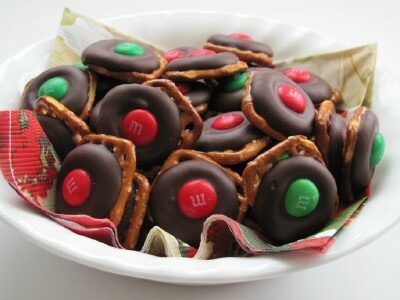 Love the pretzel bites with M&Ms. They are so cute. Thank you for the holiday meal plan resources. We’re going to be doing a lot of cooking! Great plan! I love all your candies and treats! I am baking this Thursday and I might have to add the peppermint bark to the list. Looks good! 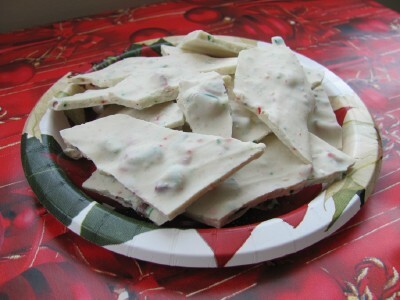 Peppermint bark is so good – reminds me of peppermint ice-cream. Your pictures make everything look wonderful. Have a great Christmas! 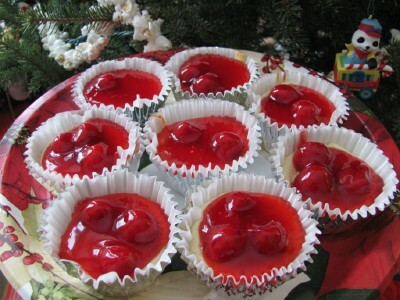 I haven’t made those Cherry Cheesecakes in years, I might just have to add those to my list! I love that you always seem to feature a food item that I’ve never seen before. 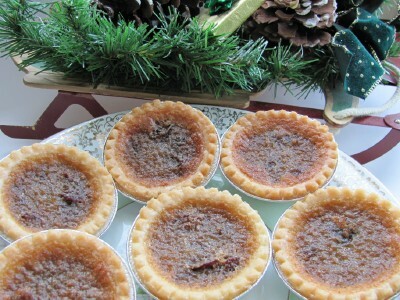 This week it’s butter tarts and they look good…but not for my diet! Yum! I love the Santa pancakes idea! That frosty peppermint dessert looks so good and easy! I hope you have a Merry Christmas! Your menu for the week looks very good and I would love one of those Butter Tarts. Thank you for sharing and hosting us today, Merry Christmas! You’re food looks really good. I have a friend who always makes the choc pretzels and now I will know how to do it also. Thanks! I am hoping to get some baking done this week. The tarts and cheesecakes look delicious! Merry Christmas! This is my first time participating, so I’d like to say thank you for setting this up and I’m really looking forward to checking out lots of recipes and ideas. Those butter tarts look like they’ll be first on my “to try” list. Thank you for sharing your menu and Christmas week plan. My family and I were just talking about what we should have for our meal (they wanted Thanksgiving..I said ‘no way’! We need to mix it up a little for Christmas). We did decide to have turkey, gravy,noodles and mashed potatoes, creamy broccoli & cauliflower, and fruit salad. For breakfast my husband and I usually make bacon and Belgium waffles (homemade). Those Santa pancakes are too cute. I may make these for Christmas Eve dinner. Hope you and your family have a terrific Christmas and thanks again for hosting MPM!! Thanks for the great ideas! I will be adding Make Ahead Mashed Potatoes this year, I think! My tip for cutting potatoes: Peel if necessary and then run through a french fry cutter before cutting. Makes the pieces beautifully uniform! 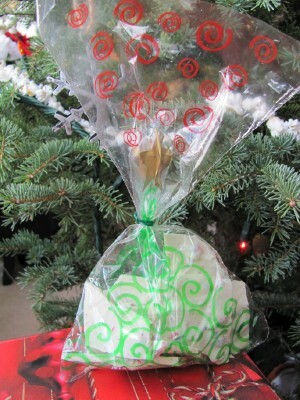 Love the peppermint dessert, I might be trying this one! Also, going to try your honey buns, they look wonderful! Thanks for the links. Merry Christmas. Thanks for joining us Stephanie! Thanks for always sharing such great and practical recipes! I was wondering if you thought the mini cheesecakes would freeze well? Yes they freeze really well Megan. Thanks for the treats at the start of your post. I will testing some of them tomorrow with my children. I wonder if we do pretzils here in New Zealand. Anyway thank you for helping me stay sane all year. I have had some inspired and less inspired weeks but this week definitly is one of my inspired moments. Perhaps that is because I am on holiday and summer is making us all happy. Those pretzel bites look delish!!! Will definitely be trying that recipe this week. Thanks for sharing! I’m glad you enjoyed the pretzel bites! Thanks for the shout-out!